When you have time, please read my ezine article, “3 Major Sources of Executive Stress”. It will offer insight to the traits that frequently contribute to stress and ways to solve them. I also believe entrepreneurs suffer from the same stressors, so I decided to interview Fran Verotsky, Director for the HACC Institute of Entrepreneurial Studies (IES). The IES program offers the tools for entrepreneurs to navigate owning a business and thus helps to prevent stressors through education. Background Info: What did you before this role? Prior to this position, I have held several different positions of HACC: faculty in the Business and Technology Departments; several administrative roles. I come from a family of entrepreneurs. My Mom and Dad were business owners; so, I grew up in that business atmosphere. Tell me about the HACC Entrepreneurial Studies program. The HACC Institute for Entrepreneurial Studies is designed to increase economic vitality in South Central Pennsylvania by providing business counseling and education opportunities to entrepreneurs and by creating partnerships through outreach programs with small businesses, government agencies, and community organizations. The IES is in existence ten years. We are proud that we now have a presence at all HACC campuses—Gettysburg, Harrisburg, Lancaster, Lebanon, and York. At all locations, we provide one-on-one business counseling, non-credit classes, seminars, networking opportunities, and Artisan Marketplaces. We also have begun offering online classes and webinars. 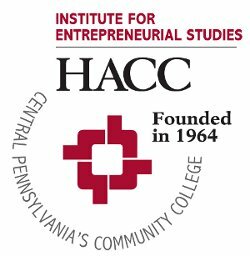 On the credit side of the IES, HACC offers an associate degree and certificate in Entrepreneurial Leadership. Most of these courses are offered at our Midtown1 location in Harrisburg with some being offered online via our Virtual Campus. Our clients encompass members of the communities where the HACC campuses are located and HACC students—with the majority being individuals who reside in HACC locations. The biggest impact our business counseling services and other programs make on emerging business owners is the security of knowing that one of our business counselors is available in a confidential setting to address particular needs. We pride ourselves by offering this 1:1 service in a long term situation with ongoing appointments and provide the individual with the necessary information and plan. It is then up to the entrepreneur to take that first giant step into business ownership. The HACC Entrepreneurial Studies program has a unique opportunity to help mold those who are just about to go into business for themselves. Some of these business owners may become executives. How does your program addresses the sources of stress, which Sylvia mentions (fear, control, and over thinking)? We believe that “truly” knowing our clients well and building a strong business relationship is a key factor. It is common to find it difficult to talk about fear, failure, and over thinking. Owning a business is risky business; therefore, entrepreneurs need to be risk takers. That has to be understood. Allowing a person to discuss these elements of fear, etc. eases some of that anxiety. Planning is essential. However, some of our clients plan for years and never open their business. Then they find out that someone else came up with a similar or identical business idea, took the leap to start the business, and became successful. Over-thinking is not always the best way to consider options. Getting involved with networking groups, such as our IES Talkabouts, lets individuals know that they are not alone in their apprehension. We find it truly amazing to watch our clients grow with self-confidence. Having a passion for whatever product or service you dream business is will be a necessity. A business owner has to have the entrepreneurial spirit. The program has been in place for several years. Have you seen students who have had their business come to fruition? How have these people changed from when they first started your program? Several students have pursued their business idea and have been successful enough to support their financial needs. Many have tried and changed their idea or gone into business on a part-time basis. Many of our clients seek our services to gain an understanding as to what is essential in getting their business started. They have the idea; we help them begin their entrepreneurial journey. Creating a business plan is one of the biggest obstacles our clients have. We assist in writing the plan; we do not write it for the client. This gives the client a clear understanding of the process and allows for their ownership of the business plan. What advice would you give to someone looking to start a business in 2011? Many people feel that the economy is unfavorable to new business development. That is true for some business ideas that would clearly be affected by customer spending, unemployment, transportation needs, and inflation. However, we at the IES feel these times offer an opportunity than can prove to be prosperous. Our client numbers have increased since the overall economy has slowed down. With careful consideration and planning, a business started in 2011 can be as successful as those started at any other time. This entry was posted in Entrepreneurs, Q & A and tagged Fran Verotsky. Bookmark the permalink.